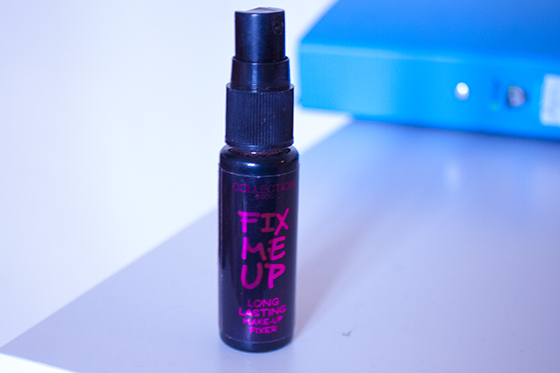 Collection Fix Me Up Spray is from the latest offerings from Collection (formerly 2000) "Primed and Ready" range. Im a religious MAC Fix + user but I didnt bring it with me when I moved back to my Mums so on a regular "Boots Binge" I decided to pick up the Fix Me Up Spray. It claims to be a long lasting makeup setting spray and I was pretty intrigued to find out more about the product. I'll start off by saying that I dont think it made my makeup last much longer, possibly just an extra hour or so. However it does work incredibly well at getting rid of that horrible powderyness you can get when you using a powder foundation. Perfect those days when you accidentally apply too much powder and it can cake slightly on the skin. I find a few pumps directly onto the face after makeup adds a nice natural, dewy radiance to the face and leaves my skin looking fresh without any stickiness or shineyness. I would point it out this is a heavily scented product, it sort of smells a bit like soap. I tend to steer well clear of anything with scent in near my face. I havent experianced any reactions to it as of yet but I thought I'd mention it The packaging isn't the nicest in the world, but the size is very convenient for travelling as it fits easily into a handbag. I was trying to think if there are any other drugstore setting sprays on the market but couldn't think of any off the top of my head. So I this could be a fairly unique addition to the high street. Although in terms of value for money Collection Fix Me Up Spray is £5.99 for 18ml, which personally I think isn't that great of a deal considering the MAC Fix+ mini sprays are 30ml and retail for £7.50. MAC Fix + has a considerable ammount of skincare benefits and can be used in more ways than just as a setting spray. In all I do think this product is pretty good for a drugstore dupe, I have seen it on offer for around £3.99 (Wilkinsons seem to have it loads cheaper!) which I think would be a more suitable price for the ammount of product you get. I don't think I prefer it to Fix + but Im sure I'll continue using it for the time being!